The Endangered Species Act is 45 years old and has a 3 percent recovery rate. It is far past time that we bring the ESA into the 21st Century. Congress last reauthorized the Endangered Species Act (ESA) in 1988. With the creation of new technologies like iPhones and the World Wide Web as well as a willingness to be part of the solution from States and local communities who have suffered unintended consequences of the Act, there are important improvements that should be made for the betterment of plants, animals and stakeholders. Thursday, July 12, 2018 | Legislative Forum 2:00-3:30p.m. in 1324 of the Longworth House Office Building (House Natural Resources Committee Room) | Press conference from 4:00-4:30p.m. 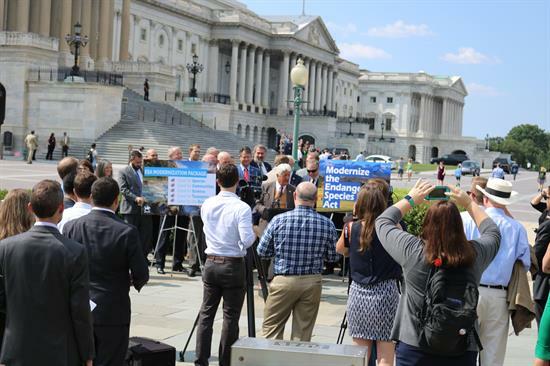 at the House Triangle, outside the Capitol Building in Washington D.C.
On July 12, the Western Caucus rolled out an important bipartisan ESA modernization package comprised of 9 bills. Click HERE, HERE, HERE, HERE and HERE for important coverage of this unprecedented legislative rollout. 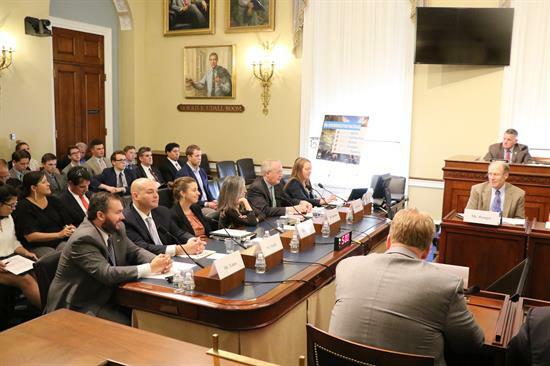 Click HERE to watch the full video of the Legislative Forum that day featuring 16 Members of Congress and 12 stakeholder witnesses. Click HERE to watch the live-stream of the Press Conference following the Legislative Forum and bill introductions. Lots of pictures and more information on these events and bills are below. Aethon Energy, American Exploration & Mining Association, American Exploration & Production Council, American Farm Bureau Federation, American Highway Users Alliance, American for Limited Government, American Loggers Council, American Petroleum Institute, American Sheep Industry Association, Colorado River Energy Distributors Association, Family Farm Alliance, Federal Forest Resource Coalition, Free Market America, Hardwood Federation, Healthy Forests Healthy Communities, Independent Petroleum Association of America, Intermountain Forest Association, Land Conservation Assistance Network, National Aquaculture Association, National Association of Conservation Districts, National Association of Counties (NACo), National Association of Home Builders, National Association of Realtors, National Cotton Council, National Endangered Species Act Reform Coalition (NESARC), National Grazing Lands Coalition, National Mining Association, National Rural Electric Cooperative Association, Neiman Timber Company, Safari Club International, United Water Conservation District, U.S. Chamber of Commerce, Western Energy Alliance, Agribusiness & Water Council of Arizona, Arizona Cattle Feeders Association, Arizona Farm Bureau Federation, Arizona Mining Association, Arizona Pork Producers Council, Arizona Rock Products Association, California Wool Growers Association, Campbell County Board of Commissioners, Colorado Cattlemen's Association, Colorado Farm Bureau, Colorado Pork Producers Council, DC Cattle Co LLC, Florida Farm Bureau Federation, Food Resource Group, Hawaii Aquaculture and Aquaponics Association, Idaho Farm Bureau Federation, Idaho Water Users Association, Imperial Irrigation District, Lake Havasu Area Chamber of Commerce, La Paz County Supervisor Holly Irwin, La Paz County Supervisor Duce Minor, La Paz County Supervisor D.L. Wilson, Minnesota State Cattlemen’s Association, Missouri Sheep Producers, Mohave County Supervisor Buster Johnson, Mohave County Supervisor Gary Watson, Montana Woolgrowers Association, New Mexico Association of Conservation Districts, New Mexico Cattlegrowers' Association, New Mexico Federal Lands Council, New Mexico Wool Growers, Oregon Water Resources Congress, Pima Natural Resource Conservation District,Utah Mining Association, Wyoming Senate President Eli Bebout, Yavapai Cattle Growers Association, Yuma County Chamber of Commerce. Arizona Sportsmen’s Groups: Apache County BigGame Forever; Arizona BigGame Forever; Arizona Deer Association; AZ Bass Nation; Bass Federation; BASS Junkyz; Flagstaff BigGAme Forever; Malihini Sports Association; Mesa/Gilbert BigGame Forever; Mognlian Sporting Association; Northern Arizona BigGame Forever; Phoenix BigGame Forever; Southwest Fur Harvesters; Sportsmen’s Business Alliance; SRT Outdoors; Tuscon BigGame Forever; Wild at Heart Adventures. Colorado Sportsmen’s Groups: Boulder BigGame Forever; Centenial BigGame Forever; Colorado BigGame Forever; Colorado Mule Deer Association; Colorado Outfitters Association; Colorado Sportsmen Make America Great; Colorado Springs BigGame Forever; Colorado Wool Growers; Grand Junction BigGame Forever; Pagosa Springs BigGame Forever. Idaho Sportsmen’s Groups: BigGame Forever Idaho; Idaho Falls BigGame Forever; Idaho for Wildlife; Idaho Sportsmen for Wildlife; Northern Idaho BigGame Forever; Pocatello BigGame Forever; Save Western Wildlife; Twin Falls BigGame Forever. Montana Sportsmen’s Groups: BigGame Forever Gallatin City; BigGame Forever Missoula; BigGame Forever Montana; BigGame Forever Park County; BigGame Forever Sweet Grass County; Citizens for Balanced Use; Montana Sportsmen for Wildlife; Montana Trappers Association; Southwest Montana SCI. Oregon Sportsmen’s Groups: Oregon United Sporting Dog Association. Utah Sportsmen’s Groups: Sportsmen for Fish and Wildlife; Utah BigGame Forever. Washington State Sportsmen’s Groups: Boeing Employees Everett Gun Club; Borderline Bassin' Contenders; Capitol City Rifle/Pistol; Cascade Mountain Men; Cascade Tree Hound Club; Cedar River Bowmen; Citizens for Responsible Wildlife Management; Double U Hunting Supply; Edison Sportsmen's Club; Inland NW Wildlife Council; KBH Archers; Kittitas County Field & Stream; National Wild Turkey Federation - South Sound Longbeards; North Flight Waterfowl; Northwest Sportsman's Club; NW Field Trial & Hound Association; Okanogan Hound Club; Pacific Flyway; Pateros Sportsman's Club; Paul Bunyan Rifle and Sportsmen's Club; Pheasants Forever Chapter #257; Pierce inlandCounty Sportsmen's Council; Richland Rod & Gun Club; Ruffed Grouse Society – WA; Safari Club International - Central WA; Safari Club International - Columbia Basin; Safari Club International - Inland Empire Chapter; Safari Club International – Northwest; Safari Club International - Seattle Puget Sound; Safari Club International - Southwest Washington; Seattle Sportsmen’s Conservation Foundation; Skagit Sportsman and Training Association; Tacoma Sportsmen's Club; Vashon Sportsmen's Club; Washington Falconer's Association; Washington for Wildlife; Washington Game Fowl Breeders Association; Washington Muzzleloaders Association; Washington State Archery Association; Washington State BigGame Forever; Washington State Hound Council; Washington State Hunter Heritage Council; Washington State Trappers Association; Washington Waterfowl Association; Washingtonians for Wildlife Conservation; Wildlife Committee of Washington. With a 3% recovery rate over 45 years, the ESA need to be modernized to better protect species, and to treat property owners, states and local stakeholders as partners rather than obstacles. ESA listings, de-listings, and critical habitat decisions impact our animals, our plants, our economy, our public health, our safety and our property rights. Defined recovery goals must be established to ensure species are removed from the list when desired population levels are met. Strengthening the Act should also include requiring actual science that is standardized, transparent and publicly available in order to make better policy decisions. The final key to improving recovery rates for plants and animals is empowering states and affected stakeholders to be part of the solution. Western Caucus Members have put forth substantive solutions to curb abuse, protect the interests of local communities and strengthen the original intent of the ESA. 1. H.R. 6356, the LIST Act, introduced by Rep. Andy Biggs (AZ-05). The LIST Act makes a number of improvements to help bring the ESA up-to-date. 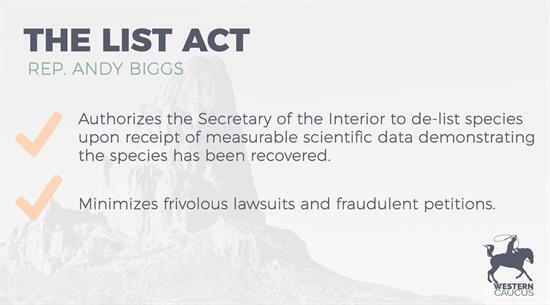 Notably, this legislation authorizes the Secretary of the Interior to de-list species when he receives objective, measurable scientific study demonstrating a species is recovered. Such measures will also facilitate states, academic researchers and outside groups in monitoring species recovery and notifying USFWS when recovery has occurred. Often, newly-discovered or poorly-understood species receive protections even though they later turn out to be ecologically abundant. 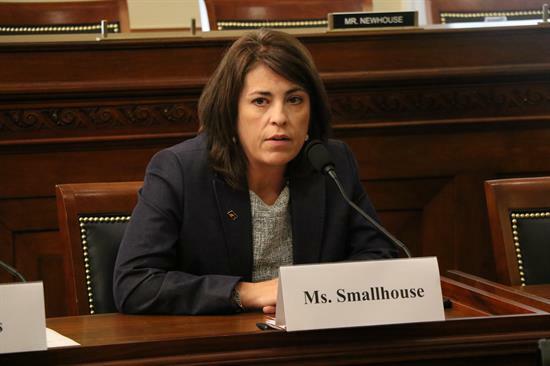 This bill creates a straightforward mechanism for USFWS to promptly act on information they receive that demonstrates a species was wrongfully listed in this manner, rather than letting the problem gather dust on the bureaucratic backburner as often happens now. Finally, the bill allows for those who are demonstrated in a civil lawsuit to have intentionally submitted false or fraudulent species data in order to cause a species listing to be prevented from submitting petitions for ten years. Click here to see the text of the bill. Click here to see the Caucus summary. Click here to see the Committee hearing memo. a. Cosponsors (30): Abraham (LA-05), Banks (IN-03), Biggs (AZ-05), Bishop (UT-01), Collins (GA-09), Cramer (ND-At Large), Duncan (SC-03), Estes (KS-04), Gianforte (MT-At Large), Gohmert (TX-01), Gonzalez-Colon (PR), Gosar (AZ-04), Guthrie (KY-02), Hunter (CA-50), Latta (OH-05), Lesko (AZ-08), Luetkemeyer (MO-03), Marshall (KS-01), McClintock (CA-04), Mullin (OK-02), Newhouse (WA-04), Noem (SD-At Large), Norman (SC-05), Olson (TX-22), Pearce (NM-02), Perry (PA-04), Smith (MO-08), Smith (TX-21), Stewart (UT-02), Thompson (PA-05). b. Endorsement in addition to the 170+ Package Endorsements: Oregon Outdoor Council. 2. H.R. 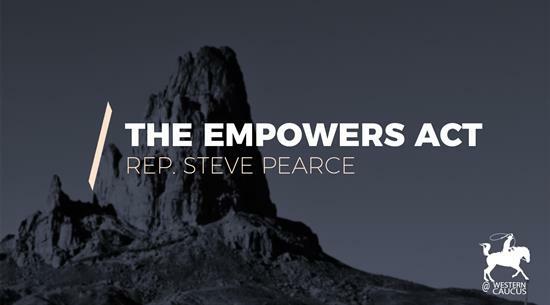 6345, the EMPOWERS Act, introduced by Rep. Steve Pearce (NM-02). While a pipeline under the ESA exists for States to provide input, the fact that the Act itself imposes no special requirement upon decision-makers to consult States has become, with the passage of time, a glaring omission. Such consultation requirements will ensure that no privileged or State-specific information slips through the cracks when listing decisions are made. The Ensuring Meaningful Petition Outreach While Enhancing Rights of States Act, also known as the EMPOWERS Act, aims to improve such consultation by 1) Ensuring that agencies making decisions about Endangered Species Act listings consult States before so doing, and; 2) Requiring decision-making agencies to provide explanation when their decisions diverge from the findings or advice of States. Click here to see the text of the bill. Click here to see the Caucus summary. Click here to see the Committee hearing memo. a. Cosponsors (31): Abraham (LA-05), Banks (IN-03), Biggs (AZ-05), Bishop (UT-01), Buck (CA-04), Collins (GA-09), Cramer (ND-At Large), Duncan (SC-03), Estes (KS-04), Gianforte (MT-At Large), Gohmert (TX-01), Gonzalez-Colon (PR), Gosar (AZ-04), Guthrie (KY-02), Hunter (CA-50), Luetkemeyer (MO-03), Marshall (KS-01), McClintock (CA-04), Meadows (NC-11), Mooney (WV-02), Mullin (OK-02), Newhouse (WA-04), Noem (SD-At Large), Norman (SC-05), Perry (PA-04), Rokita (IN-04), Schweikert (AZ-06), Smith (MO-08), Smith (TX-21), Stewart (UT-02), Thompson (PA-05). 3. H.R. 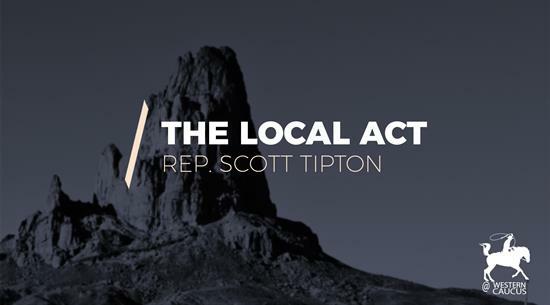 6344, the bipartisan LOCAL Act, introduced by Rep. Scott Tipton (CO-03). 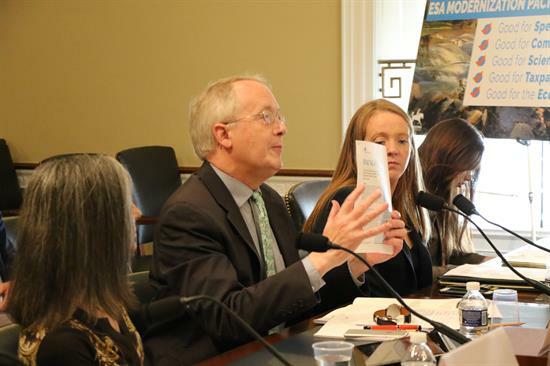 Species conservation experts and policy powerhouses alike have recommended for decades that the Endangered Species Act be amended in order to codify incentives and set clear statutory channels for recognizing such voluntary efforts. Since species conservation is the ultimate aim of the Endangered Species Act, and a greater sum total of voluntary, successful species conservation efforts incontrovertibly aid that aim, it is nothing more than common sense that such channels facilitating and encouraging voluntary conservation be a part of the Act. 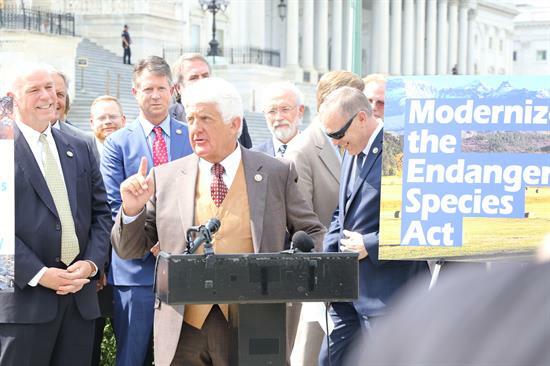 This legislation would do just that, codifying voluntary conservation programs like Species Recovery Agreements (SRAs) and Habitat Reserve Agreements (HRAs). Each of these kinds of agreements between the Secretary and other entities have distinct applications and structures and are most successful at facilitating species recovery under different circumstances, but what they have in common is the increased leverage and more diverse toolkit they provide the Secretary in making decisions for the best interests of an endangered species. The second component of this bill sets up another set of new incentives and opportunities for voluntary conservation by establishing a private party conservation grants program, and a habitat conservation planning loan program for state and local governments. These programs will save taxpayer money while boosting conservation. Click here to see the text of the bill. Click here to see the Caucus summary. Click here to see the Committee hearing memo. a. Cosponsors (24): Abraham (LA-05), Banks (IN-03), Biggs (AZ-05), Bishop (UT-01), Cramer (ND-At Large), Duncan (SC-03), Estes (KS-04), Gianforte (MT- At Large), Gonzalez-Colon (PR), Gosar (AZ-04), Hunter (CA-50), LaMalfa (CA-01), Latta (OH-05) Luetkemeyer (MO-03), Marshall (KS-01), Mooney (WV-02), Newhouse (WA-04), Noem (SD-At Large), Norman (SC-05), Rokita (IN-04), Schrader (OR-05), Stewart (UT-02), Glenn Thompson (PA-05), Walden (OR-02). 4. H.R. 6355, the PETITION Act, introduced by Rep. Bruce Westerman (AR-04). The United States Fish and Wildlife Service (USFWS) is instructed by law to issue decisions on petitions within specific timeframes established in the Act. When they miss those timelines, they are vulnerable to lawsuits by petitioners. A final, crucial fact to note: Anyone can submit any number of petitions containing any amount of information – or misinformation. 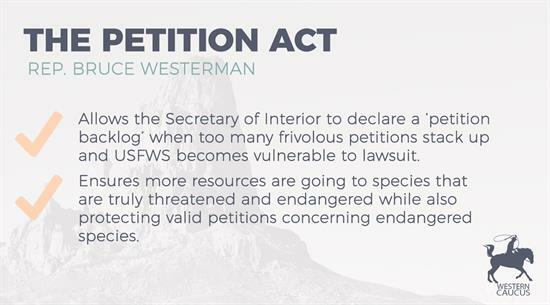 This bill reforms that petition process, allowing the Secretary to declare a ‘petition backlog’ when too many frivolous petitions stack up and USFWS becomes vulnerable to lawsuit. All necessary protections for legitimate species listing requests which contain sufficient, duly-collected scientific information remain in place under this bill. However, petitions designed to jam the system and secure unwarranted species listings are automatically discharged during a backlog. The legislation allows Congress to step in and prevent illegitimate mass-listings of unqualified, understudied species as well as ensure more resources go to species that are actually threatened and endangered. Click here to see the text of the bill. Click here to see the Caucus summary. Click here to see the Committee hearing memo. a. Cosponsors (23): Abraham (LA-05), Banks (IN-03), Biggs (AZ-05), Bishop (UT-01), Collins (GA-09), Cramer (ND-At Large), Duncan (SC-03), Estes (KS-04), Gohmert (TX-01), Gosar (AZ-04), Guthrie (KY-02)*, Hunter (CA-50)*, Latta (OH-05), Luetkemeyer (MO-03), Marshall (KS-01)*, McClintock (CA-04), Mooney (WV-02), Newhouse (WA-04), Noem (SD-At Large), Norman (SC-05), Rokita (IN-04), Smith (MO-08), Stewart (UT-02). 5. H.R. 6364, the LAMP Act, introduced by Rep. Don Young (AK-At Large). Local governments, tribes and states have been successful players in species conservation and recovery since passage of the Endangered Species Act (ESA) in 1973. Despite their strong track record, the Act itself contains a relatively weak framework for facilitating interaction amongst these players and federal species conservation-responsible agencies. 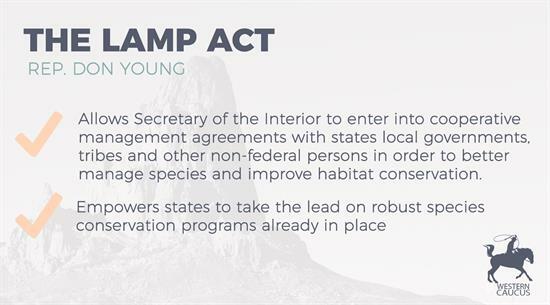 The LAMP Act permits the Secretary of the Interior to enter into cooperative management agreements with states local governments, tribes and other non-federal persons in order to better manage species and improve habitat conservation. 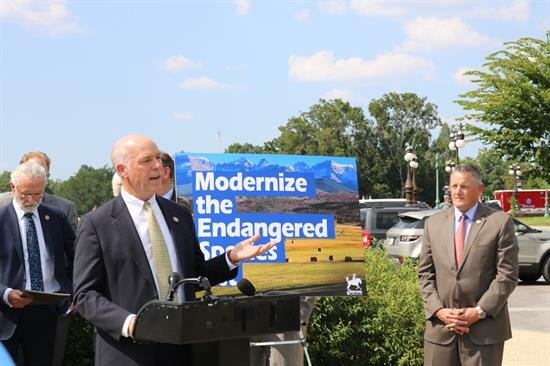 The bill also empowers states with robust species conservation programs already in place to take the lead in managing and preserving such species when meeting certain qualifying conditions. Under the LAMP Act, the Secretary will finally have the authority to collaborate with local stakeholders to decide how best to make use of their talents, interest and expertise for the benefit of species recovery and habitat preservation. Click here to see the text of the bill. Click here to see the Caucus summary. Click here to see the Committee hearing memo. a. Cosponsors (27): Abraham (LA-05), Banks (IN-03), Biggs (AZ-05), Bishop (UT-01), Cramer (ND), Duncan (SC-03), Emmer (MN-06), Estes (KS-4), Gianforte (MT-At Large), Gohmert (TX-01), Gonzalez-Colon (PR), Gosar (AZ-04), Guthrie (KY-02), Hunter (CA-50), Luetkemeyer (MO-03), Marshall (KS-01), McClintock (CA-04), Meadows (NC-11), Mooney (WV-02), Newhouse (WA-04), Noem (SD-At Large), Norman (SC-05), Pearce (NM-02), Rokita (IN-04), Smith (TX-21), Stewart (UT-02), Thompson (PA-05). b. Endorsement in addition to the 170+ Package Endorsements: Colorado Outfitters Association and the Oregon Outdoor Council. 6. H.R. 6360, the PREDICTS Act, introduced by Rep. Ralph Norman (SC-05). Despite the inflamed rhetoric of partisans on either side, robust, effective species conservation can readily coexist with project permitting and economic development. Perhaps no better example of this exists than the one provided with Habitat Conservation Plans (HCPs) developed and implemented under the Endangered Species Act. HCPs are comprehensive planning documents created collaboratively between Fish and Wildlife or National Marine Fisheries and a person, government or corporation pursuing permitting and development for a project which is likely to result in listed species takings. To be approved, these plans normally require incidental take permit applicants to identify all anticipatable ways in which a project and its operations may result in species takings, and successfully account for them through mitigation, remediation and compensation. 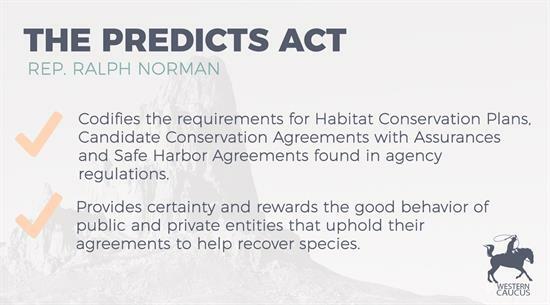 While HCPs are relatively well known, Candidate Conservation Agreements with Assurances and Safe Harbor Agreements are two other existing programs established by federal agency handbooks that encourage voluntary species conservation and investment in exchange for certainty. This simple bill aims to codify the requirements for HCPs, Candidate Conservation Agreements with Assurances and Safe Harbor Agreements found in agency regulations in order to provide certainty and reward the good behavior of public and private entities that faithfully uphold their agreements in order to help recover listed species. Click here to see the text of the bill. Click here to see the Caucus summary. Click here to see the Committee hearing memo. a. Cosponsors (22): Abraham (LA-05), Banks (IN-03), Biggs (AZ-05), Bishop (UT-01), Cramer (ND-At Large), Duncan (SC-03), Estes (KS-04), Gohmert (TX-01), Gonzalez-Colon (PR), Gosar (AZ-04), Hunter (CA-50), Luetkemeyer (MO-03), Marshall (KS-01), McClintock (CA-04), Mooney (WV-02), Newhouse (WA-04), Noem (SD-At Large), Perry (PA-04), Rokita (IN-04), Stewart (UT-02), Tipton (CO-03), Walden (OR-02). 7. H.R. 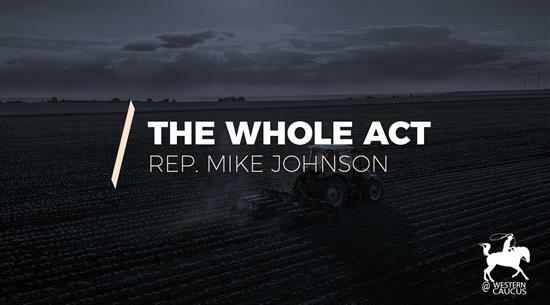 6346, the bipartisan WHOLE Act, introduced by Rep. Mike Johnson (LA-04). This simple bill ensures that the totality of conservation measures underway will be considered before taking federal actions that impact species. Further, this good governance and common sense legislation will reduce costs associated with consultation, allow important projects to move forward while ensuring these actions don’t negatively impact species and result in more private contributions that help recover endangered species. In May, the House passed a nearly identical amendment (H.AMDT.631) to the Farm Bill. In recent years, local landowners showed unprecedented support for Lesser Prairie Chicken conservation and committed approximately 4 million acres and more than $26 million towards these efforts. Unfortunately, current practices do not allow conservation measures that take place outside of designated critical habitat to count in relation to federal actions. This arbitrary interpretation results in less conservation efforts for species and stifles private investment that would otherwise be encouraged if the totality of habitat conservation measures underway were allowed to be considered. The WHOLE Act addresses this problem. Click here to see the text of the bill. Click here to see the Caucus summary. Click here to see the Committee hearing memo. a. Cosponsors (31): Abraham (LA-05), Banks (IN-03), Biggs (AZ-05), Bishop (UT-01), Cramer (ND-At Large), Duncan (SC-03), Estes (KS-04), Gohmert (TX-01), Gonzalez-Colon (PR), Gosar (AZ-04), Hunter (CA-50), Johnson (OH-6), Jones (NC-03), LaMalfa (CA-01), Luetkemeyer (MO-03), Marshall (KS-01), McClintock (CA-04), Meadows (NC-11), Mooney (WV-02), Mullin (OK-02), Newhouse (WA-04), Noem (SD-At Large), Norman (SC-05), Pearce (NM-02), Perry (PA-04), Rokita (IN-04), Schrader (OR-5), Stewart (UT-02), Thompson (PA-05), Walker (NC-06), Wilson (SC-02). b. Endorsements in addition to the 170+ Package Endorsements: National Cotton Council Louisiana Farm Bureau Federation, Louisiana Cotton & Grain Association. 8. H.R. 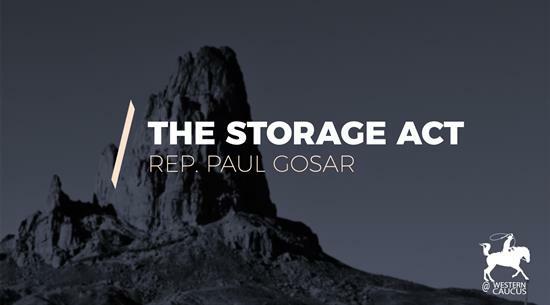 6354, the STORAGE Act, introduced by Rep. Paul Gosar (AZ-04). In the past, the U.S. Fish & Wildlife Service (USFWS) has proposed critical habitat designations which pass through or include limited water infrastructure areas. Though these cases represented USFWS simply failing to understand before issuing a proposal that this land is inherently unsuitable for critical habitat designation under the Act’s own definition – for failing to be free from “disturbance and destruction” – statutory language which provides for a de-facto exclusion of these limited areas that are crucially important for reservoir and water delivery operations across the country should be instituted in order to settle any confusion before it can take place, boost efficiency and categorically prevent these wrongful listings. Limited reservoir and other artificial water delivery land is not useful for the endangered species in question because it in fact lacks the characteristics that would contribute to their recovery. But if it is designated “critical” under the Act, it counts towards species recovery efforts. This simple bill will ensure sure these confused and mistaken listings cannot take place – for the benefit of listed species, water and power infrastructure operators as well as water and power customers. Click here to see the text of the bill. Click here to see the Caucus summary. Click here to see the Committee hearing memo. 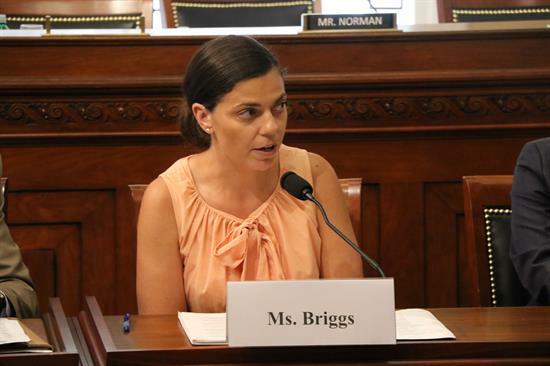 a. Cosponsors (20): Abraham (LA-05), Banks (IN-03), Biggs (AZ-05), Bishop (UT-01), Cramer (ND-At Large), Duncan (SC-03), Estes (KS-04), Gohmert (TX-01), Gonzalez-Colon (PR), Hunter (CA-50), LaMalfa (CA-01), Luetkemeyer (MO-03), Marshall (KS-01), McClintock (CA-04), Mooney (WV-02), Newhouse (WA-04), Noem (SD-At Large), Norman (SC-05), Perry (PA-04), Rokita (IN-04). b. Endorsement in addition to the 170+ Package Endorsements: Salt River Project. 9. H.R. 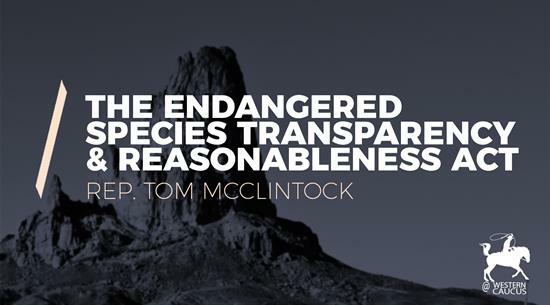 3608, the Endangered Species Transparency and Reasonableness Act, introduced by Rep. McClintock (CA-04). H.R. 3608 requires data used by federal agencies for ESA listing decisions to be made publicly available and accessible through the Internet, allowing the American people to actually see what data is being used to make key listing decisions. The bill also requires the federal government to disclose to affected states all data used prior to any ESA listing decisions and require that the “best available scientific and commercial data” used by the federal government include data provided by affected states, tribes, and local governments. H.R. 3608 also requires the U.S. Fish and Wildlife Service to track, report to Congress, and make available online: 1) funds expended to respond to ESA lawsuits; 2) the number of employees dedicated to litigation; and 3) attorney’s fees awarded in the course of ESA litigation and settlement agreements. 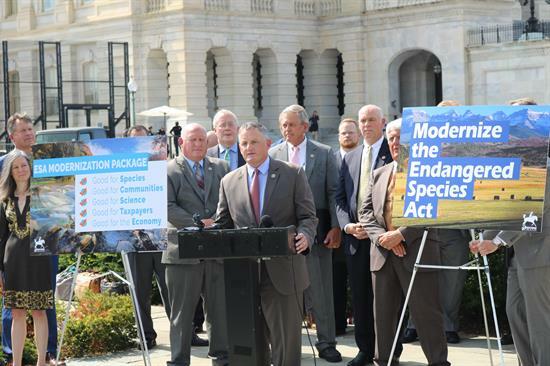 Finally, this bill prioritizes resources towards species protection by placing reasonable caps on attorney’s fees and making the ESA consistent with another federal law. The Equal Access to Justice Act currently limits the hourly rate for prevailing attorney fees to $125 per hour. However, no such fee cap currently exists under the ESA, and attorneys have often been awarded huge sums of taxpayer-funded money. This bill would put in place the same $125 per hour cap on attorney’s fees for suits filed under the ESA. Click here to see the text of the bill. Click here to see the Caucus summary. 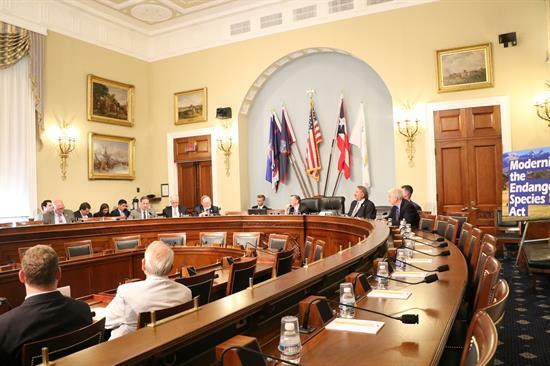 Click here to see the Committee hearing memo. a. Cosponsors (22): Banks (IN-03), Biggs (AZ-05), Estes (KS-04), Gianforte (MT-At Large), Gohmert (TX-01), Gonzalez-Colon (PR), Hunter (CA-50), Huizenga (MI-02), Jenkins (KS-02), Jones (NC-03), LaMalfa (CA-01), Luetkemeyer (MO-03), Marshall (KS-01), Mooney (WV-02), Mullin (OK-02), Norman (SC-05), Pearce (NM-02), Perry (PA-04), Rokita (IN-04), Stewart (UT-02), Thompson (PA-05), Tipton (CO-03). 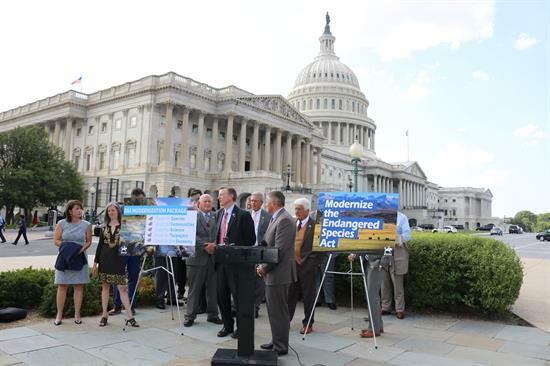 Western Caucus Chairman Paul Gosar (AZ-04) said, "15 Members of Congress, 12 panelists, nine bills, and a combined thousands of hours of experience dealing with the Endangered Species Act at all levels. That's what we put on display today when we introduced our ESA modernization package and held a packed Legislative Forum and press conference. We showed everyone that Congress can come together to scope out a problem, listen and learn from affected parties, set out clear principles, devise bipartisan proposals and introduce them in a show of unity. 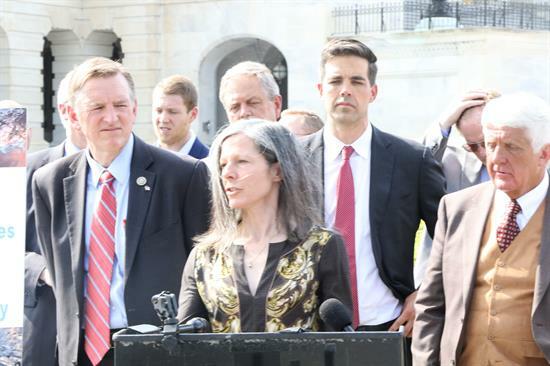 Just one of those is usually enough to derail a Congressional effort, so I am very proud of this group of Members for coming together and unveiling a package of smart, targeted, thoughtful modernization amendments to the Endangered Species Act of 1973. My friend and Democratic Caucus Member from Oregon Kurt Schrader even came onboard to cosponsor the LOCAL and WHOLE Acts - and he tells me he's reviewing the other bills closely to see how they read to him. I challenge all Members, advocacy and industry groups and media observers to follow Rep. Schrader's lead and look closely at what we've proposed here, to consider carefully the testimony of millions of Americans as to the longstanding and fixable failures of the ESA to conserve species and balance interests appropriately - to do all of that, and then tell me you can't come onboard with our effort." Congressman Greg Gianforte (MT-At Large) stated, "Montanans have a deep respect for and appreciation of our lands and the wildlife that occupy them. Montanans believe we can support multiple use of lands while conserving species. Unfortunately, environmental extremist groups have distorted the Endangered Species Act from its original intent and use it to unnecessarily shut down needed projects throughout Montana. 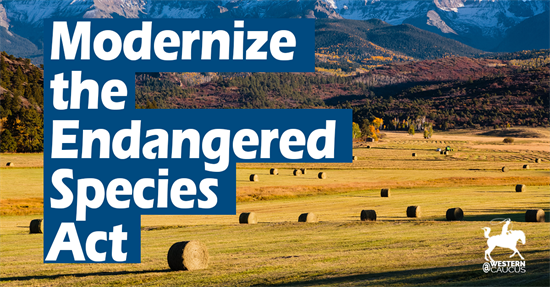 Today’s package of bills offers us an opportunity to modernize the ESA with targeted reforms that will encourage greater input from leaders on the ground, spur partnerships between communities to preserve habitats, and bring some common sense back to protecting endangered species." 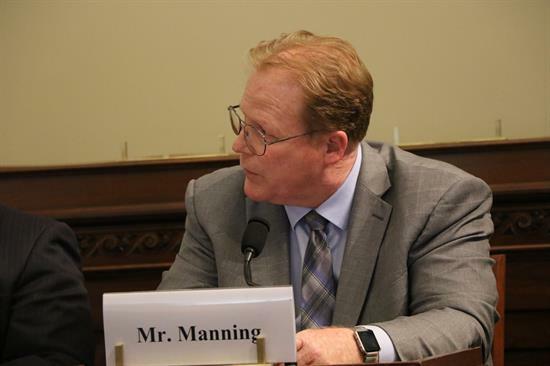 Congressman Roger Marshall (KS-01) stated, "The heartland and at-risk species benefit most when conservation efforts work hand-in-hand with landowners. The Endangered Species Act was created 45 years ago and has only achieved recovery for about 2 percent of the listed threatened species – with that track record, seeking improvements to the Act should be a no-brainer. 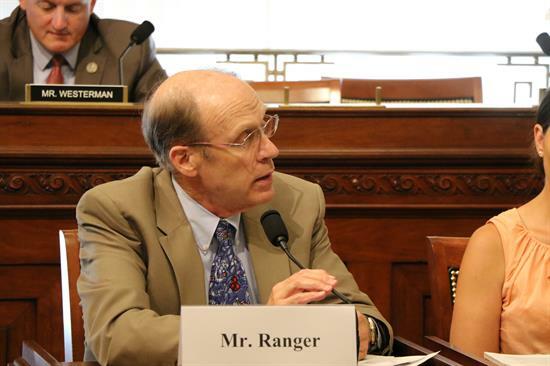 As an avid outdoorsman, I’ve seen first-hand the success of public and private dollars working with landowners to rebuild and preserve habitats for our Lesser Prairie Chicken (LPC) – without the bird being a listed species. On-the-ground conservation efforts, along with a little cooperation from Mother Nature has increased the LPC population by almost 71 percent since the 2013 drought. 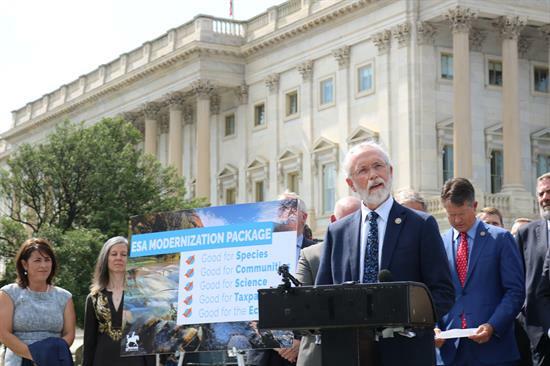 While there is still more that we can and should do, a top-down ESA approach only threatens conservation and is proven to be ineffective, that’s why I am a proud cosponsor of the Western Caucuses Endangered Species Act Modernization Package. Local personnel have the greatest resources and knowledge of our wildlife needs, not Washington D.C."